home / Multimedia / The Holy Land in news / “The desire of water”: a real help to the families in .. The project ‘The desire of water’ has started again during the summer. 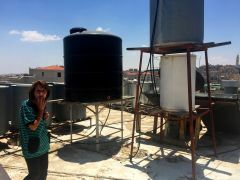 The aim of the project is to provide new water tanks, panels and water heaters to families in need of Bethlehem. The supply of drinking water in the West Bank, is particularly difficult due to a distribution system and building services that are antiquated, defective and no longer able to guarantee adequate hygiene standards. The high water demand, cuts in water supply and leaks that are around 40% of the water distributed, give us the picture of an emergency that Association pro Terra Sancta tries to heal every year in favor of the Bethlehem community. “We live in a neighborhood where water is distributed once every three weeks” says Emad, one of the beneficiaries, “with only one tank we had to take my daughter, who is just one year old, at my parents’ house to bathe her. Otherwise we had to ask the neighbors for to lend us a few bottles of water! Now there’s enough water that heats automatically on the roof“. These precious testimonies remind us that the benefits that we give for granted, are not so in other parts of the world. Every day there are families who wake up not knowing if they will have water to drink, to wash or cook. Support the project “The desire of water” in Bethlehem!